These adorable Turkey Cookie place card holders will do double duty at the Thanksgiving table by showing the kids where they should sit. Imagine how delighted to see their names poking out of one of these cute little guys? November 2 is National Cookie Monster’s Day. 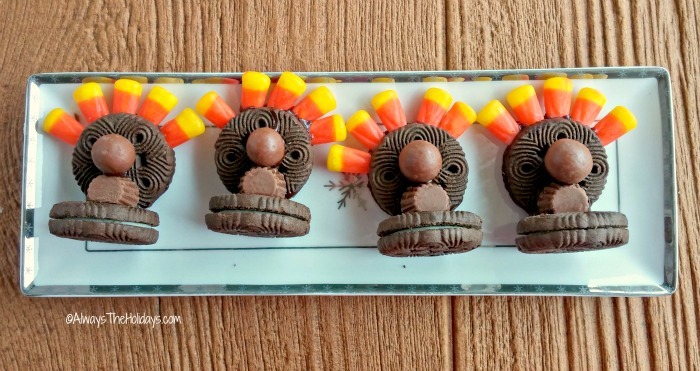 These cute turkey cookies are something that he would drool over! November is a month just full of National Food Days. Discover more about the November National Days here. Most of us will decorate our tables for Thanksgiving with a creative tablescape that sets a mood. But what about the kids? One of my favorite memories from Thanksgiving dinners as a child was the day I graduated to the “grownups table.” I’m not sure whether I would have wanted to move up, and miss out one these place cards though. They are so cute! Edible Place Cards for Thanksgiving? 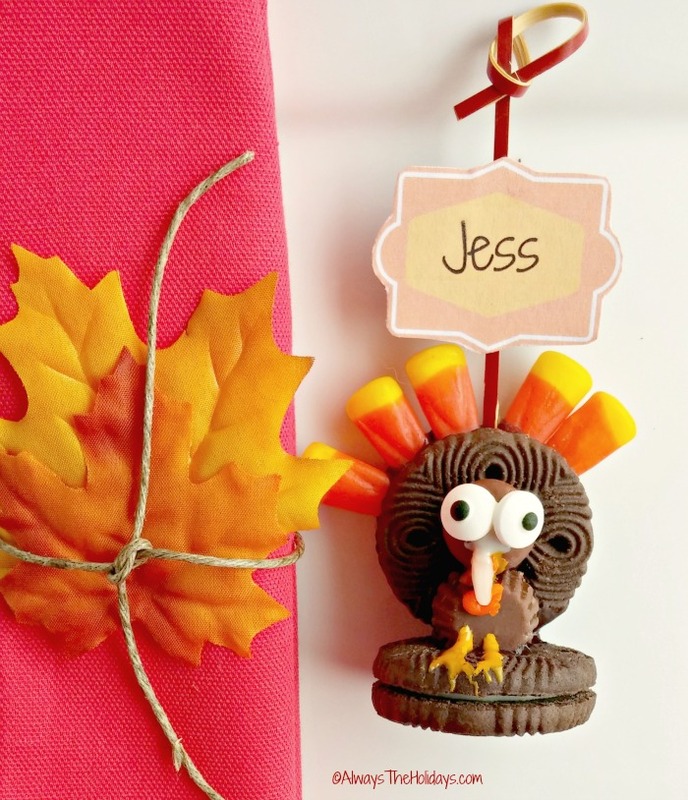 This holiday turkey cookie place card holders project is as much fun to make as it is to eat. The whole thing is edible when done, (other than the name and toothpick) and the kids will love to eat their place card as a dessert. 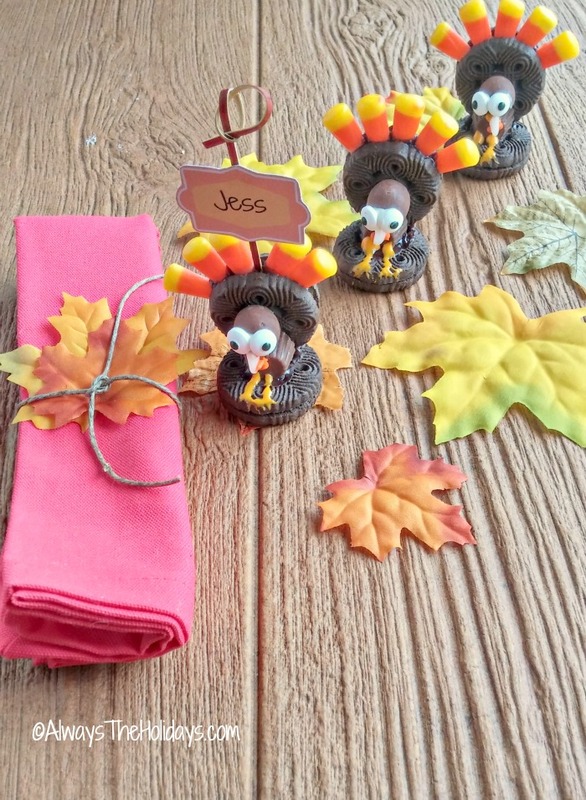 Dress up the kids table at Thanksgiving with this Turkey Cookie Place Card Holders. 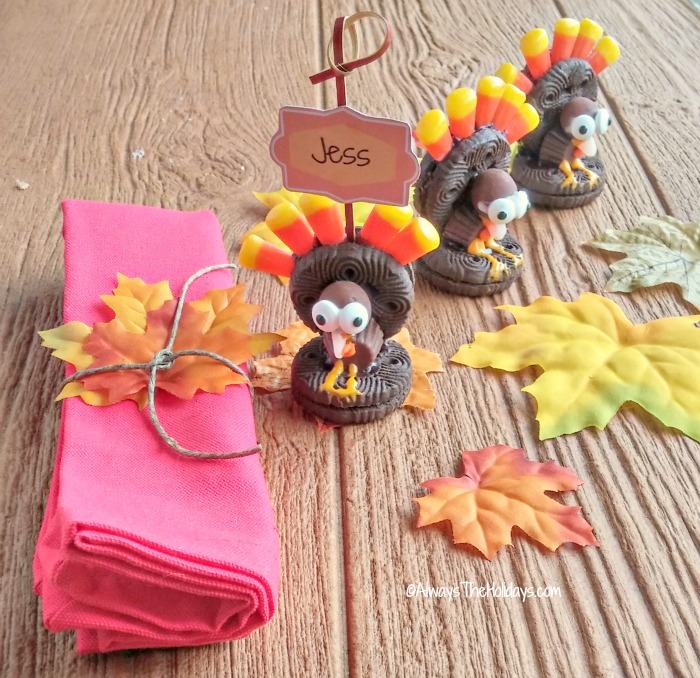 These Thanksgiving turkey cookie place card holders are so much fun to do. You start by putting together the Turkey cookies and then print out the place card template and attach it to the area of the turkey feathers. 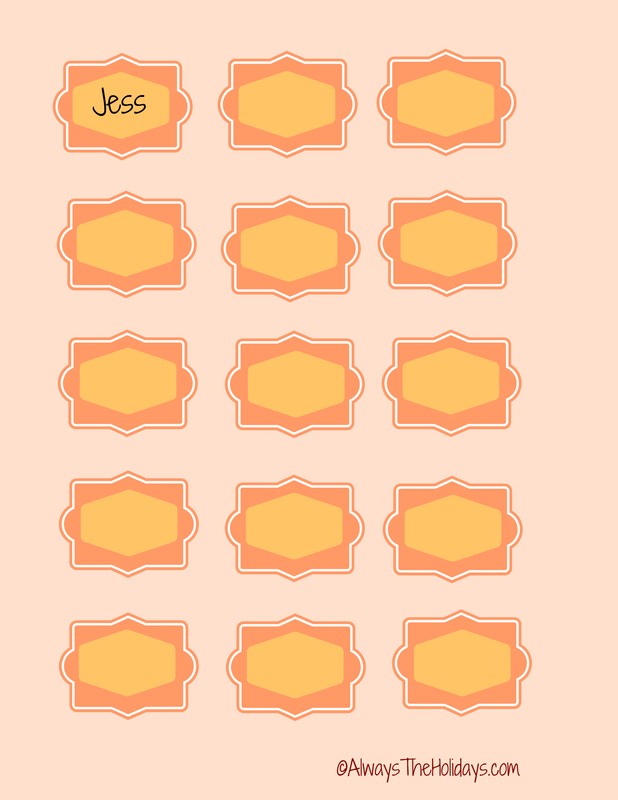 printable for place cards. See the link in the instructions below. I started by opening the cookies and adding a strip of chocolate frosting. This helps to give the candy corn feathers something to stick to. The next step is to assemble the bases and turkey bodies. I added a dab of chocolate frosting to the back of one cookie and stood the cookie with the features on it. At this stage, it is good to lay the cookie on its back, or it will just topple over. ASSEMBLY TIP. Make sure your frosting it thick. I used the tubes and they worked okay but I wish I had done the project with home made frosting. I think it might have set more quickly. Once the cookie bases have somewhat set, the trimmed peanut butter cup and whopper to the back cookie with another dab of frosting. Let them set for several minutes. Next step is to add the nose and eyes. I added a dab of vanilla frosting and placed the white tip of a candy corn piece for the nose, and then a strip of vanilla frosting on the whopper and added the edible eyes. Combine some red and yellow food coloring to vanilla icing and make an orange color. Use a toothpick to make a little turkey craw. Now is the time to place these in the fridge for a bit. This will help the frosting to go hard and the details to set into place. While these were setting, I made my place cards. Here is a free printable so that you can do yours. It is easiest to print out the the whole design on a page size sticky label. 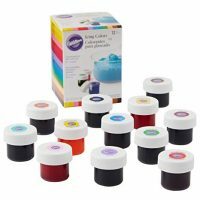 Then stick the label to a piece of poster board and cut out the place cards and hand print the names on it for the children who will be at Thanksgiving. 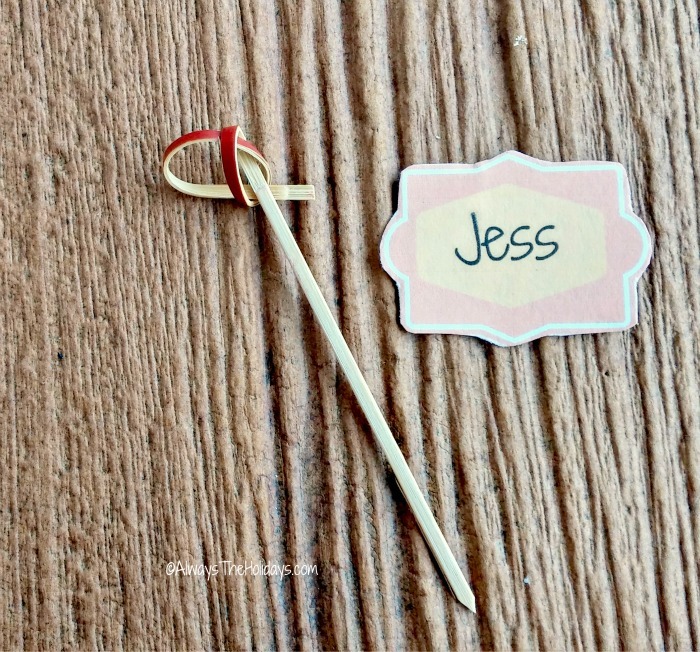 Use a fancy knotted toothpick and a dab of hot glue to attach the toothpick to the back of the place card. Take the cookies out of the fridge and use the orange frosting and another toothpick to make feet for the turkey. Put the place card into the area behind the candy corn feathers and display the turkey cookie place card holders with pride. Don’t be surprised if all the grownups want to sit at the kid’s table this year! These adorable little turkey cookie place card holders will be the hit of your dinner and will delight both young, and young at heart! As an added touch, take a couple of silk leavesand some juteand wrap then around a napkin for a festive look. 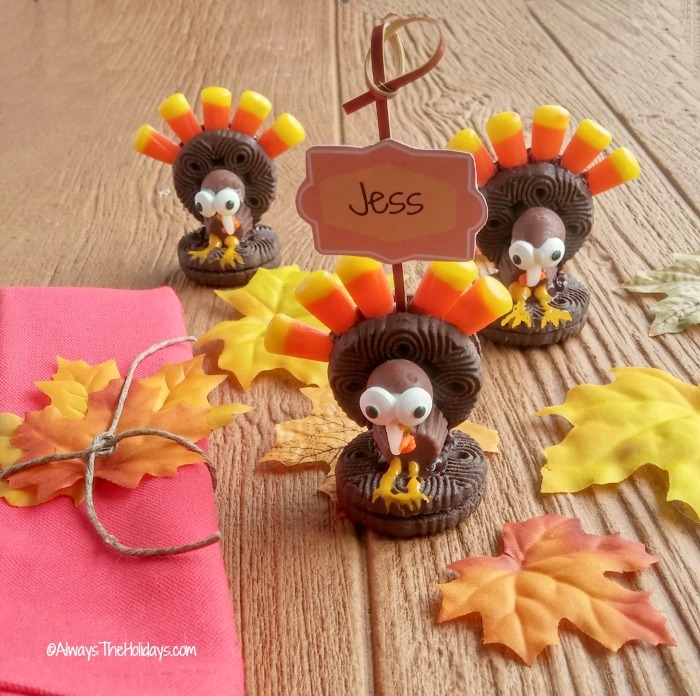 This adorable turkey cookie place card holders will do double duty by showing the kids where to sit at the Thanksgiving table this year and giving them a sweet dessert at the end of the meal. What fun! What sort of fun place card holders do you use for your guests during the holidays? Please leave your ideas in the comments below. Share…Share…! 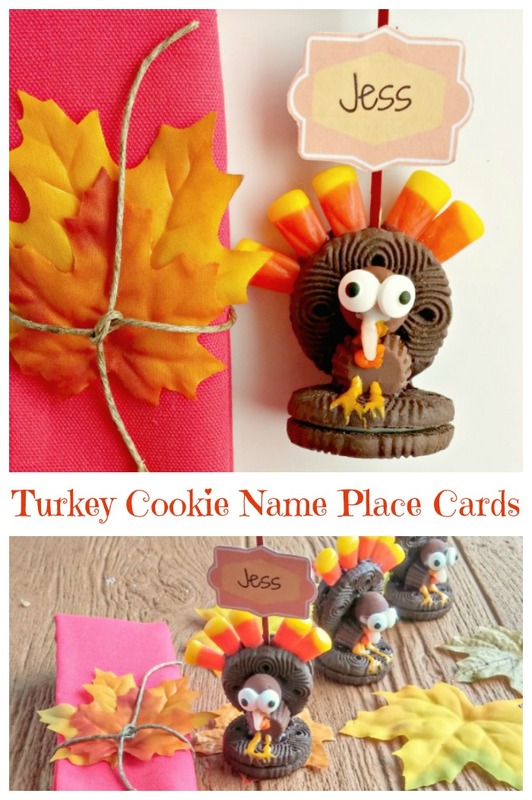 Would you like a reminder of these Thanksgiving turkey cookie place card holder project? Just pin this image to one of your Thanksgiving boards on Pinterest so that you can easily find it later. Admin note: This post first appeared on the blog in October of 2013. I have updated the post with a printable project card and video for you to enjoy. 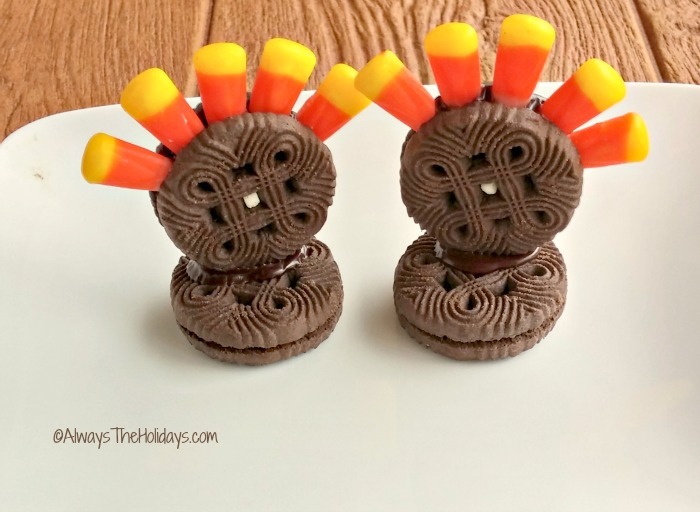 These adorable little turkey cookie card holders will have all the adults wanting to sit at the kid's table for Thanksgiving. Open the cookies and adding a strip of chocolate frosting around the edge of the cookie. Place the cookies back together. Push 5 pieces of candy corn into the chocolate frosting. 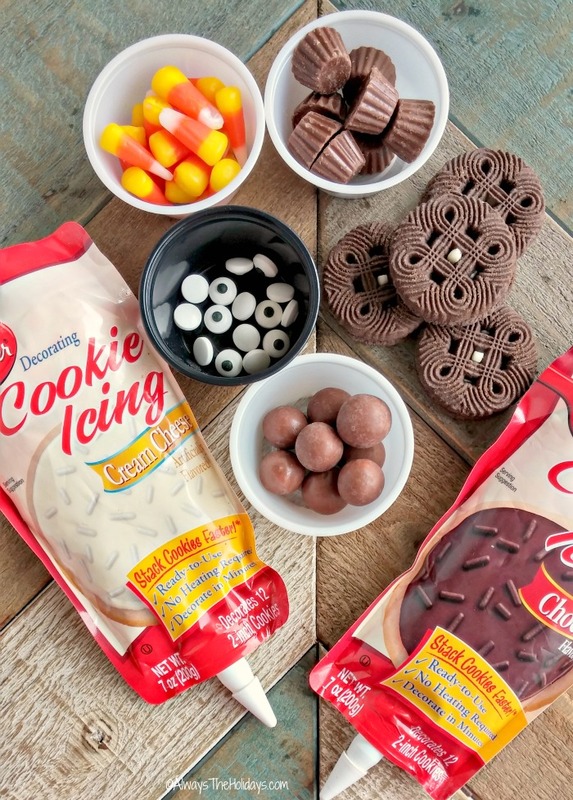 Add a dab of chocolate frosting to the back of one cookie and position the cookie with the features on it. Trim off the edge of the peanut butter cups. Lay the assembled two cookie shape on its back to make it easy to work. Add some chocolate frosting and then attach the peanut butter cup for the stomach and Whopper for the head. 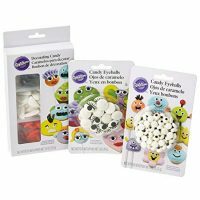 Add a dab of vanilla frosting and place the white tip of a candy corn piece for the nose, and then a strip of vanilla frosting on the whopper and add the edible eyes. Combine some red and yellow food coloring to the vanilla icing and make an orange color. Use a toothpick to make a little turkey craw. Place in the fridge to allow the turkeys to set and become very firm. 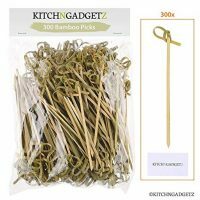 Print out the name cards, cut and attach a fancy knotted toothpick with a dab of hot glue to the back of the place card. Use the food dye to make some orange frosting and pipe feet on the turkeys. Insert the name cards and display at each place setting. I found it easier to work with the cookie shapes lying on the back of one cookie. Be sure each stage is firm before moving on to the next step. I bet the kids love these! !